To help explain our belief that good design makes good business sense, we turn to a global authority: Francis Duffy, chairman of the renowned architecture firm DEGW. Eleven years ago, in 1997 (before Google and email became household terms), he published The New Office, a seminal book on office design. Duffy found that organizational work patterns were being fundamentally altered by key trends in information technology, flattened hierarchies—with emphasis on teamwork and cross-functional interaction, and service-led economies. So he felt the design logic of office layouts needed a rethink. Space planning in offices used to be based largely on organizational structure and hierarchy, with little regard for work processes. A more efficient approach was to plan on the basis of jobs carried out. Extensive research led him to two key variables that determined the nature of work in any organization: interaction and autonomy. Combining these variables in various ways, he outlined four basic work patterns: hives, cells, dens and clubs. “Hive" workers work by themselves on routine tasks, with low levels of interaction and autonomy. BPOs and call centres are classic examples. Since workers must stay seated in one place for fairly long shifts, hive office plans invariably result in densely packed workstations. “Den" work is interactive, involving a lot of teamwork, but not necessarily autonomous decision-making, as with advertising agencies and some media units. 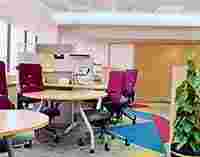 Individuals have their own desks in an open-plan setting, sharing common facilities such as printers. In highly knowledge-driven enterprises, employees are both autonomous and interactive. Such organizations require “clubs": spaces for sporadic meetings that involve varying numbers of people. Recognizing this need, the corporate office for the DP Jindal Group was designed to include an assortment of formal conference rooms and informal lounges. In reality, all four work patterns are found in any typical company, and any one can dominate, depending on the industry and culture. The challenge is to reconfigure the office to keep up with evolving workflows without disrupting the actual work. DWP Interics devised an innovative solution for consulting firm Accenture’s 10,000sq. ft Delhi office. Consultants are a nomadic tribe, working in different-sized teams, both in and out of the office. To allow for the “variable density" of employees, mobile modular furniture systems were installed. Each workstation was equipped with two tabletops, one of which could be pulled out to encourage group sessions when needed. Coffee bars that doubled up as workstations for temporary “touchdown" knowledge workers were added. The “club" can turn into a “cell" at a moment’s notice. Aparna Piramal Raje is director, BP Ergo. Radhika Desai is a Mumbai-based interior architect.